Making a difference for his community and the people he cares for are what’s most important to Howard Marsh, an EMT-paramedic with OSF PRO Ambulance in Champaign, Illinois. 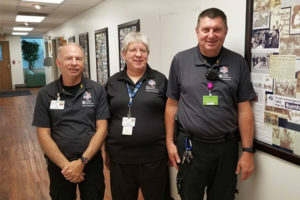 From left to right: Howard Marsh, Paramedic, alongside Joyce Willskey, Emergency Medical Dispatcher, and Todd Jones, Lead Paramedic. All three Mission Partners have been with OSF PRO Ambulance since the very beginning. Howard, 64, began his career journey by helping organize a volunteer rescue squad in his hometown, St. Joseph, Illinois, located between Urbana and Danville. After that experience, “we decided St. Joe needed a rescue squad,” he said. Howard took his first EMT class at Parkland College in Champaign in 1981 where he received EMT I-basic certification. From there, he and others got the rescue squad established. “We ended up begging and getting a little bit of equipment and then we got a budget,” he said. After working at IGA for 18 years, Howard decided a full-time career as an EMT was his calling. In 1987, PRO Ambulance, which became OSF PRO Ambulance in 2018, began operations, servicing OSF HealthCare Heart of Mary Medical Center in Urbana, Illinois. It is a member of the East Central Illinois EMS System, the largest EMS system in East Central Illinois. OSF PRO Ambulance is an Illinois Department of Public Health licensed provider at the Advanced Life Support (ALS) level. It is staffed by skilled paramedics who provide patients with critical, life-saving care – 24 hours a day, seven days a week, 365 days a year. Howard was hired at OSF PRO in 1987 and went on to get his EMT-paramedic certification at Parkland and other training through the Illinois Fire Service Institute. Since becoming an EMT-paramedic, Howard has served as a mentor and has taught EMT classes at Parkland. He admits it takes a certain type of person to stay in the career he has chosen. Being an EMT is a very gratifying job, Howard said. He especially appreciates being part of a larger emergency medical services family that includes firefighters and first responders from throughout the area. “You have good days, you have bad days. It’s not for the weak,” he said. “A lot of calls you go on don’t have very good outcomes. But you try to remember the good calls. I still go home and rethink what happened and what differently I could have done. To learn about EMT opportunities at OSF HealthCare, visit osfcareers.org.